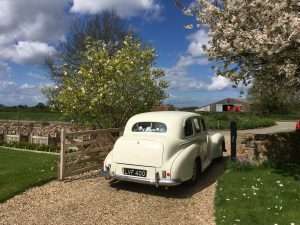 Our first wedding party came to stay with us at Green Farm Barns on Wednesday. The beautiful bride, brides mother and bridesmaids stayed the night before the big day! They looked fabulous as they headed off in the shiny white classic car! The happy wedding day was held at the magical Thursford Garden Pavilion www.thursfordgardenpavilion.com a 2 minute drive away from us! They couldn’t have been more lucky with the weather!